Whether you’re making way for fencing, garden landscaping, new lawn, construction or a pathway. Blackwood Tree Service has a specialised stump removal team that can help get the job done! Stumps are a source for attracting pests like termites, cockroach’s even ants. Stump accidents, with children and party goers alike these are a disaster just waiting to happen. Fungi love stumps and it can affect not only nearby garden beds but surrounding trees. Stumps that regrow with epicormic shoots can be dangerous because of their poor adhesion and therefore larger regrowth can be prone to failure. 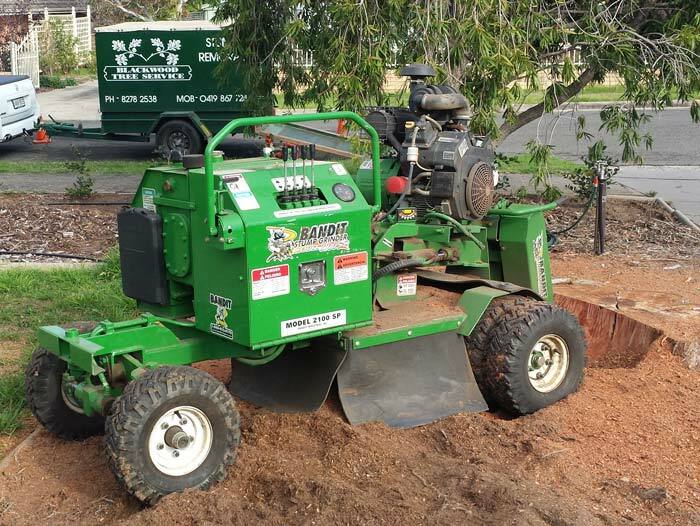 Blackwood Tree Service stump grinding is a safe and effective method for removing tree stumps. Stump Grinding is an environmentally-friendly technique which works on reducing the stump to a pulp like state which is placed back into the area, where the stump originated as a soil base. Stump Poisoning is a cost effective way to stop the tree from regrowing, effectively leaving the stump as a natural garden feature.